Shrub Hill is to this day, although somewhat diminished, still an impressive site to visit. 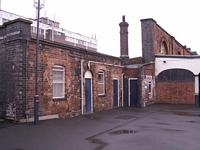 Opened as a joint Midland and Oxford, Worcester and Wolverhampton Railway (later GWR) station in 1852, considerable facilities were provided at the site. 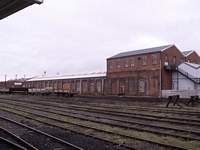 Due to the joint nature of the site, both a Midland and a GWR goods shed were provided, extensive goods sidings, two loco sheds, a branch serving local industry known as the 'Vinegar Branch' and locomotive, carriage and wagon works. 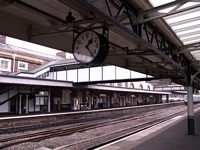 The station still operates both main line and local services serving both Walsall and Paddington, for example, and still retains what are, in relation to many other station, significant station facilities and staffing levels. 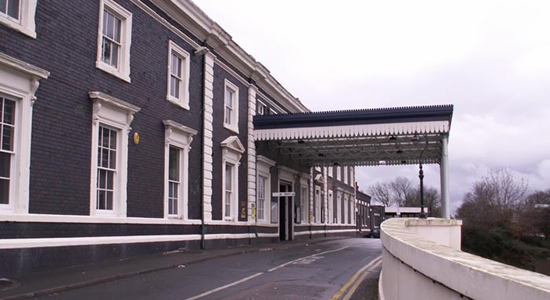 Above we see the impressive entrance building and booking hall off Shrub Hill: its scale is impressive and period details appear to be maintained - note the fringed canopy and the street lamp to the right of the shot. 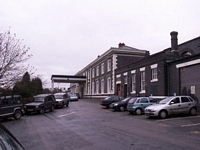 In the above-left shot we have moved back to take a shot that gives a better indication of the size of the station building itself - unfortunately, an office building has been build in front of the station which partly obscures what would have been a rather impressive sight looking up Shrub Hill. Above-right we are again looking at the station entrance from the opposite direction to that taken at the top of the page. Above-left we have entered the station proper and crossed the line to platform 2: the entrance from the booking hall can be seen on the opposite platform (platform 1) next to the notice board on the left-hand side. 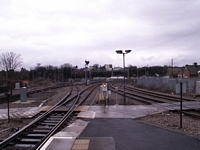 The track layout that can be seen is an up and a down line, with the centre line providing a stabling facility for trains 'off route' only. 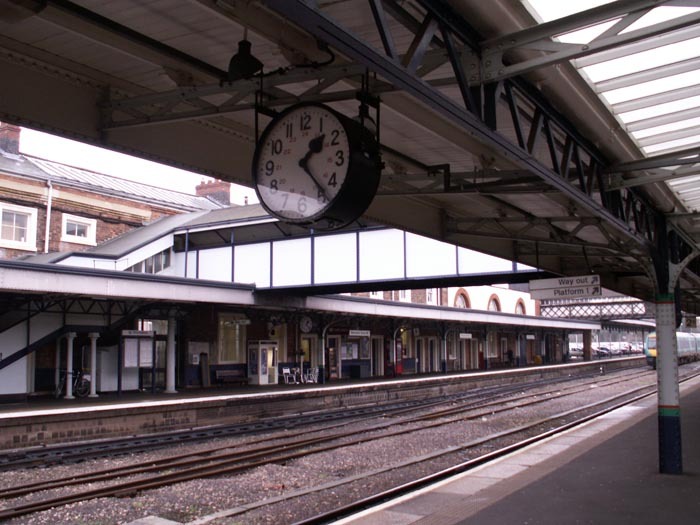 The shot above-right is taken at the South end of the station on platform 1. 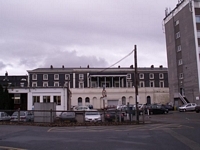 What we see here are the now disused parcels bays which, as the name suggested, were used for Royal Mail trains and their loading and unloading. 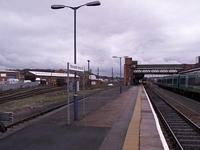 Above-left we are parallel with the previous shot but have moved to the right and onto platform 3 (this being an island platform numbered 2 to the left and 3 to the right). 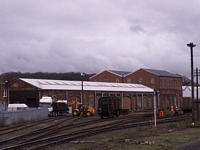 To the right we can see the extensive GWR goods yard with the end of the ex-goods shed visible on the right-hand side. 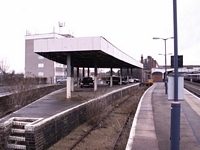 Above-right we have walked to the other end of the platform and are looking South. 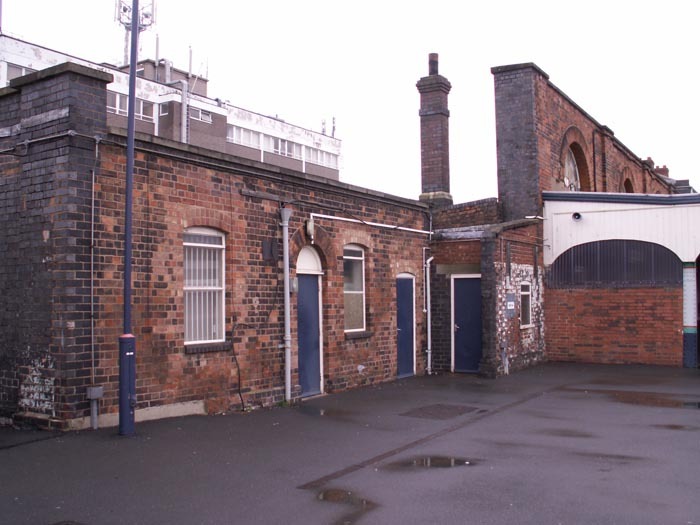 What is apparent here is the loss of part of the station structure itself: the area from the wall of the station to the small brick hut in the centre of the shot was occupied by a considerable station building spanning two lines. 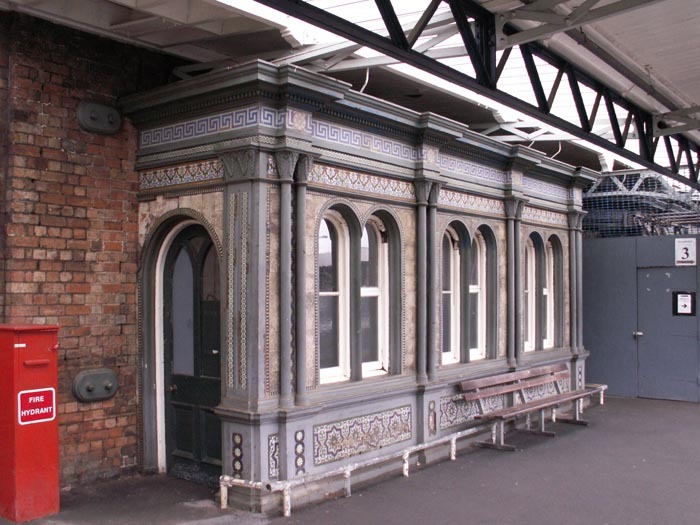 Above-left we are on platform 2 looking at an interesting period piece. I assume, although there was no way to tell, that this was once a waiting room. 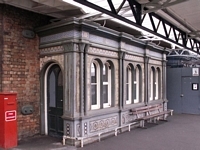 However, regardless of its original function, it is refreshing that it has been preserved at the site and appears in good condition and has retained most of its ornate tiling. Above-right we are standing on the footbridge looking south with a class 180 Paddington service at platform 2. The walling to the extreme left and right originally supported an over-arching roof here which has, unfortunately, long-since been removed: imagine an overall roof and the platform canopies removed - a station of some significance! 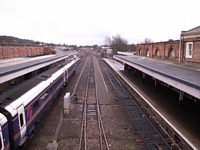 Above-left we are looking North from platform 2 and can see the line bifurcate: Birmingham to the right and Worcester Foregate St to the left. 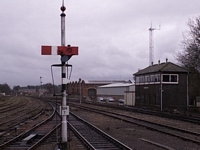 Straight ahead, between the splitting lines, lay the main engine shed which has sadly been demolished: some diesel refueling tanks can now be seen near its site and Network Rail facilities in the right-foreground. 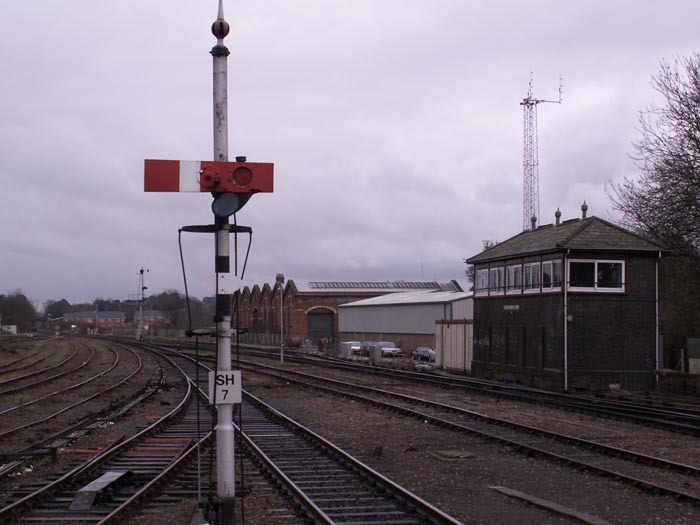 As we continue our tour of the perimeter of the operational platforms, above-right we see the station signal box, this is not original (previously there were two) but built in 1935. 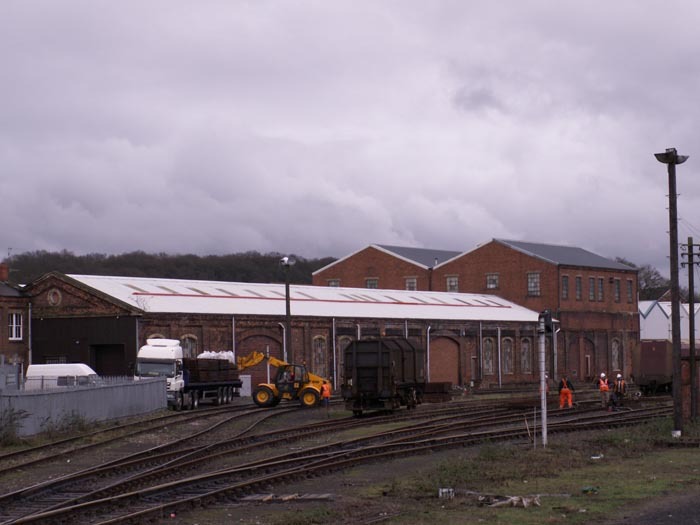 The large brick structure just beyond the signal box was the Midland Railway goods shed however, all lines leading to this facility have now been lifted but it is good to see the structure still in situ unlike many of its 'peers' at other sites in the region. 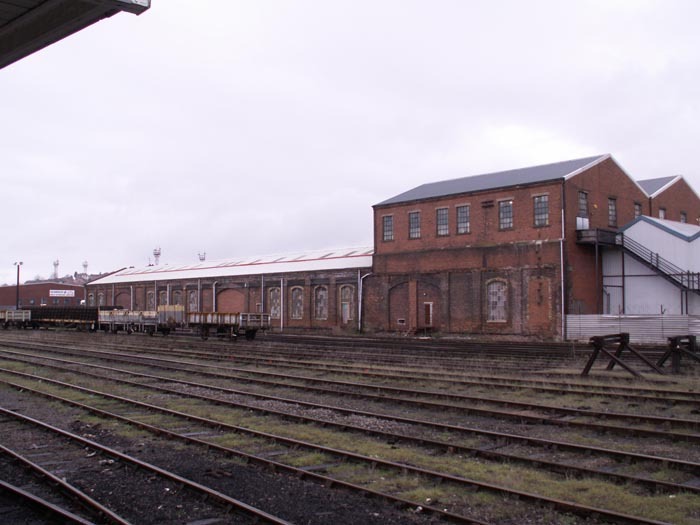 Turning 90 degrees to our left from the previous shot we see the GWR goods shed, also in good order, albeit the various apertures connecting the interior with the railway have long been bricked-up. 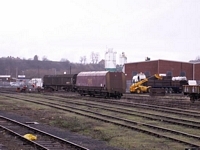 This shot, and the one to its right, show the extensive sidings, previously the GWR goods yard, still available (but seldom used) at the site. 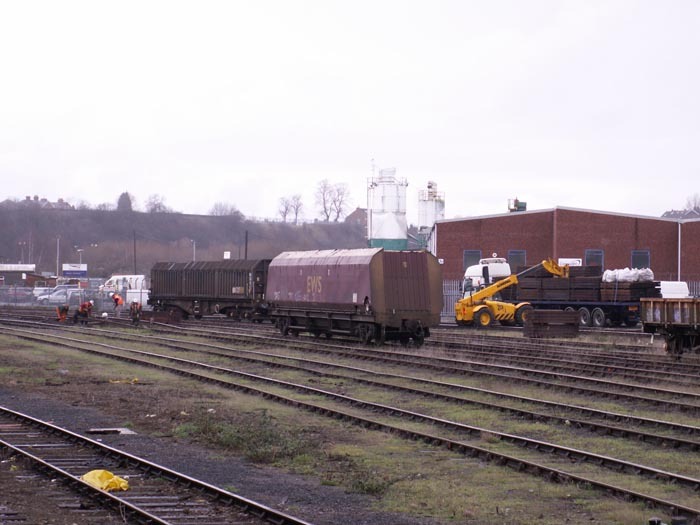 Interestingly, the above-right shot shows a permanent way crew removing track and loading it onto a truck: I watched for quite some time and no replacement track was laid so I wonder if I got there just in time to see the demise of the goods sidings! 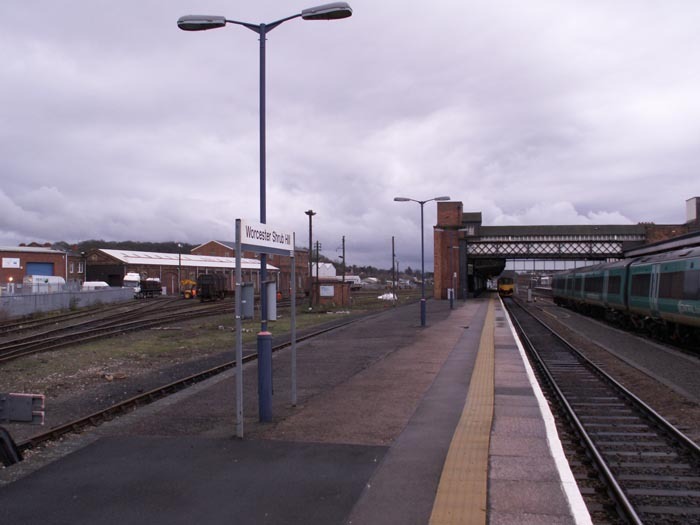 Above-left is a further shot of the goods sidings and the track removal operation this time seen from the North-end of platform 3. 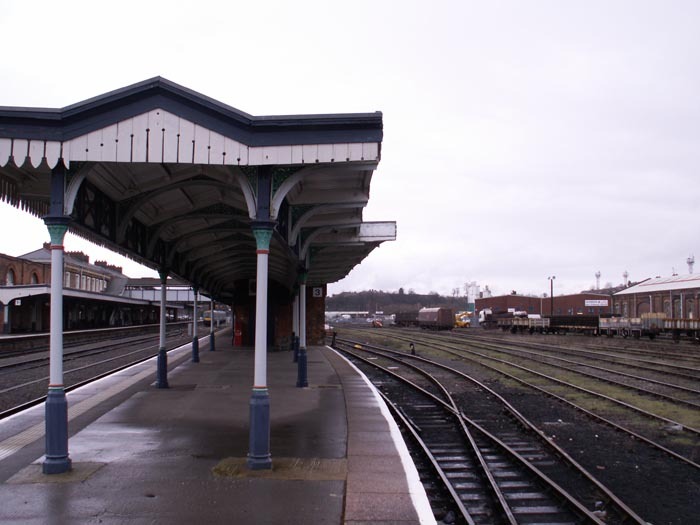 Above-right we are back on platform 1, with the parcels bays to our rear and track to our right. 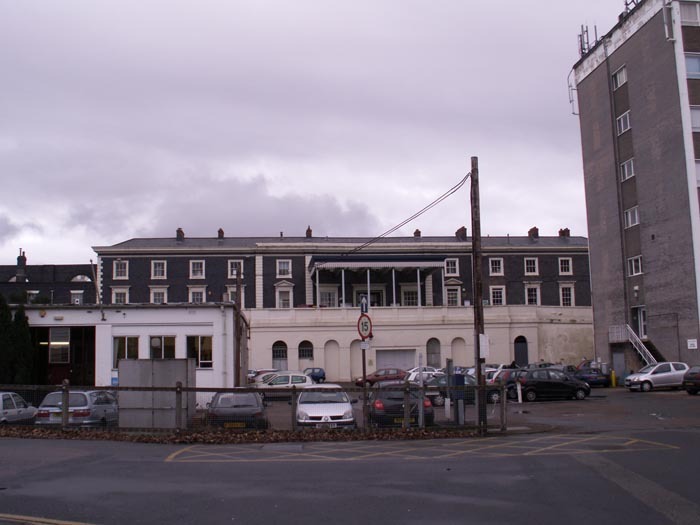 This shot demonstrates well the wall that supported the overall roof (top-right) which now is almost a 'facade' and the replacement for the roof - platform canopies - which have themselves been modified during their lifetime: note the bricked-up archway ahead! All-in-all a very interesting site to visit and one to which, time permitting, I'd like to return and explore the sites of some of the more outlying facilities. 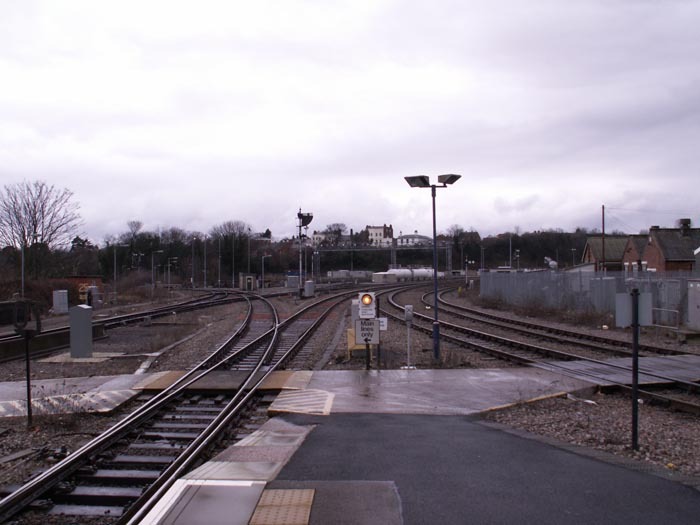 Furthermore, the extensive use of semaphore signalling arrays is worth a visit alone!